I’m sure you have heard of affiliate marketing? But, what do you know about it? This article will probably help you as it is all about affiliate marketing for newbies. How to get started and begin to make money online from the comforts of your home. If you are you a newbie or would like more information about how to get started in affiliate marketing? This article hopefully will help clear up some of the misconceptions about affiliate marketing. I will try to give a honest and factual review of what to expect from affiliate marketing. It’s not a get rich quick scheme, where you just push a button and the money flows in . Those enticing advertisements almost always are a scam, the only one getting any money are the advertiser when you join up. This article will explain in-depth what it really entails to be an affiliate marketer. If you are new to affiliate marketing, hopefully this article will give you a clear understanding of what it’s about. First it is a low-cost way to get your own business started, without a brick and mortar building with all the start-up cost like rent, licenses, wages, payroll and inventory. An on-line business has a lot less headaches. You promote other people’s products and earn a commission. Very little overhead involved. It sounds simple, which it is after you have been doing it for a while, but it is not that easy, until you have learned the process and are able to put it into practice. If it was that simple the whole world would be on the bandwagon. It takes a lot of determination and desire to succeed. It entails work and a strong desire to learn affiliate marketing and then to make money doing it. On the plus side, there is very minimal start-up costs involved, mostly just time and determination. You have to be willing to work hard, be dedicated and work through the problems you will encounter. But there is lots of opportunity available if you are willing to work hard. This can be done by anyone, even if your computer skills are limited. I know mine were very limited. There are thousand of big name companies who are using this method to generate sales to help save on advertising costs. Macy’s, Walmart, Weight Watchers, just to name a few. Your commission could be as low as 1% or up to 75% for digital products. With Amazon most commissions run between 4 and 10 %. It’s really quite simple. First you join an affiliate program. You can join an affiliate program thru Clickbank, which deals mostly in digital products. You can join Amazon as an affiliate which sells thousands of products on line, also is a very popular affiliate program. I, personally think Amazon is the best affiliate program to start with. It is the easiest to set up and you are usually accepted within a day or two. And it’s quite simple to join. Just make sure you have a website set up. You will need a website to be approved by Amazon for you to become an Amazon Affiliate. Once you join an affiliate network you need to research the network and check out all the product you can promote. Starting with Clickbank, just log into their home page and join. They have excellent training on how to use Clickbank. There is sign-up form which is quite easy to follow and they have many tutorials to help you get started. With Amazon, go to Amazon Associates and sign up there. Most affiliates sites you can join for free and there is not much required. There are hundreds of affiliate sites to sign up for, but I think these are the two easiest to get started with. I will include a list later in this article. First you will need to find a topic or product that interests you. What do you like to do? What are your hobbies? Do you enjoy golf, fishing, cooking? Make sure it is something you have a passion for, some knowledge of and can write about. If you need some ideas go into Amazon and search books for dummies. There are lots of ideas to help you get started. There are over 40,000 dummy books available. After you find a topic or product, you need to build a website. Some sites tell you don’t have to build a website. But you definitely need a website. There are many sites available to build a website, some for free and some you will have to pay for. Go online and search for information. But be careful you don’t get involved with a “get rich quick” program. You will not only not earn any money, you will be giving a lot of it away. There is a lot to learn when starting out and there will a lot of questions to be answered. So make sure you do your research. There are many places to find hosting. Finding a domain name is picking a name that is simple, easy to remember and reflect you and your interests. It’s easy to get side tracked and get away form your main objective due to the fact that there is so much information to entice you. Make sure you know your product or topic and give your visitors detailed and precise information about that product. Don’t get side tracked into adding a lot of other products on your site. Here is the list of some of the affiliate networks where you can find products to promote. 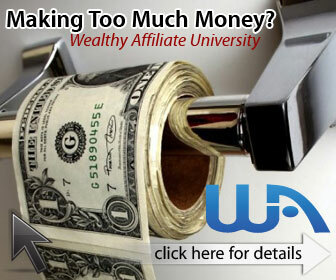 If this has sparked your interest and you would like an excellent course to work with, check out my review of Wealthy Affiliate. It is the # 1 site for affiliate training. There are over 1 million members and a very active community to help you over any hurdles. Many of the members earn a lot of money with this program. Plus, you can join for free, that’s right FREE! And not just for a week or a month. For as long as you need. They have everything to offer you to help you get a business up and running. All kinds of training, lessons, videos, help section, websites and everything to get a business started. I am here to help you, if you need anything, contact me and I will gladly be willing to lend a hand or point you in the right direction.